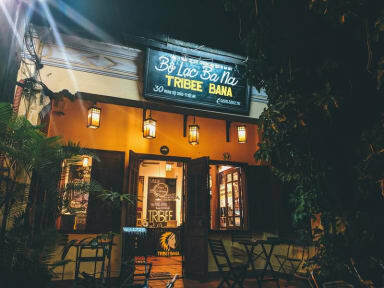 Tribee Bana Hostel i Hoi An, Vietnam : Boka nu! Great staff, great location, great activities, great breakfast. No bunk beds and big lockers. Super clean. My favorite hostel in Vietnam so far. Haha what to say about this place! The happiest hostel in the world? At least the staff, so positive, helpful and friendly! Arranged activities everyday followed by free beer or rum&coke, but don’t get me wrong, this is not a party hostel! At 10pm the music shuts down and the people who wants to go out do a pub crawl! Perfect set up! Rooms were cleaned everyday and the showers had strong water pressure and warm water.. I really recommend this place to everyone! Mycket bra personal och dagliga aktiviteter som anordnas av hostelet! Enda minus är att om man har rum nära det gemensamma utrymmet så är ljudvolymen mycket hög. 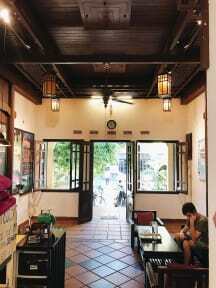 A really nice and social hostel without being a party hostel and noisy at night. Really friendly people there and because of the daily free activities you get to know almost everyone at the hostel. Definitely join in on the free street food tour, so good! The beds are really comfy and clean, so are the bathrooms. The free breakfast is really nice as well and the hostel is located really close to the water in the old quarter. Would definitely recommend and stay again myself! Fräscht hostel med jättetrevlig och hjälpsam personal! Rummet var rätt små och intima men fina och madrasserna var sköna. Wifi:et var det allta bästa vi haft här i Asien. Hostlet anordnar gratis aktiviteter varje kväll vilket är ett roligt initiativ som får gästerna att socialisera och samtidgt få upptäcka staden eller Vietnams traditioner. Uppskattat! Vi trivdes jättebra här och bokade ytterligare en natt på Tribee Bana för att hinna se mer av staden. Så himla mysigt ställe!! Läget är superbra och personalen är så trevlig! The location is good, close to the old town and markets. The straff is amazing, they’re glad to help! Also the hostel is really generous, for exempel we joined the ”springroll class and dinner” which was so much fun. We learned to do springrolls and then there was a lot of dinner, all for free! I loved this place! !